Skipper Jim Ervin is one of four Ballymena United players suspended for Saturday's trip to Ballinamallard. Picture: Press Eye. 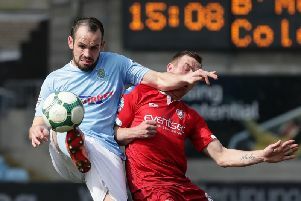 Ballymena United manager Glenn Ferguson admits his squad is down to the bare bones ahead of this Saturday’s Danske Bank Premiership fixture at Ballinamallard United. Ferguson was already going to be without skipper Jim Ervin, midfielder Gavin Taggart and defender Johnny Taylor for the trip to Ferney Park due to suspension. They are joined in the sin bin by Tony Kane, automatically banned after his dismissal in the weekend defeat by Linfield. “As well as the suspensions, Eoin Kane came off with an injury on Saturday and Willie Faulkner was injured in midweek, so it looks as though we’re going to have to dip into our reserves and bring a couple along. “Allan Jenkins accidentally stood on Willie’s foot against Carrick and he has injured his fourth and fifth metatarsals. They’re not broken, it’s a soft tissue injury, but still painful. “Hopefully he will have been able to train this week and be available for Saturday. “Seventh place still gets you a chance of a European place via play-offs and we will endeavour to stay at least seventh but I want to try and get sixth - that has always been our aim. “We’re five points behind Glentoran and I think it’s still achievable to catch them. “We still have eight games to try and do that and we play Glentoran pretty soon so it’s important that we focus on the Ballinamallard game and really take it to them and get a positive result,” the manager added.